It’s hard to imagine anything more appetizing than the house-filling fragrance of simmering bo kho, the classic Vietnamese beef stew. For those die-hard carnivores who shy away from Asian food, this dish is the perfect introduction to a new world of flavors. This is rib-sticking comfort food at its finest, with a new dimension that comes from the creative use of the intensely aromatic herbs and spices that infuse it with the characteristic flavors of Southeast Asia. Vietnam has long been a cultural crossroads, a fact which is clearly reflected in its cuisine, which is highly sophisticated, yet charmingly simple in its preparation. No other cuisine on earth features such fresh ingredients that burst with brightly contrasting flavors and vivid aromas. 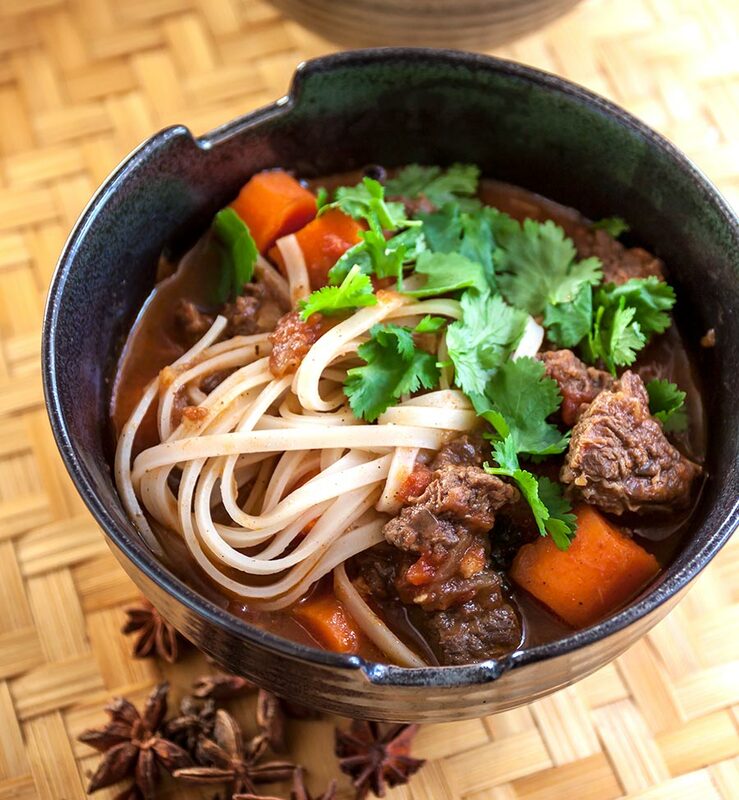 Bo Kho is enjoyed at any time of the day. Fragrant with fresh lemongrass, star anise, Five spice powder and ginger, it can be eaten as breakfast, a quick lunch or satisfying dinner. Accompaniments can vary; ladle it over thin rice noodles, serve with steamed rice or simply with a crisp baguette on the side. Beef chuck works well in this hearty dish, but feel free to try other cuts, such as cross-cut shanks, oxtail or even bison, as we did. 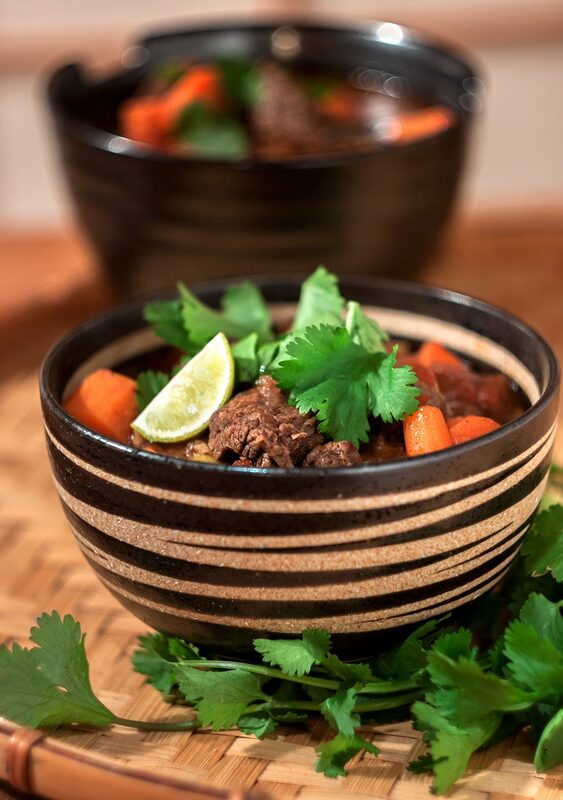 The long, slow simmering works wonders on the lesser cuts, rendering them meltingly tender and succulently delicious. There are as many versions of this dish as there are cooks and each one differs slightly in the details. Most, however, share some basic elements which we’ve endeavored to incorporate and pass on to you. This version is inspired by and largely adapted from food writer and cookbook author Andrea Nguyen’s recipe. We’ve made a few changes to suit our personal taste, cooking style and the contents of our pantry. We encourage you to do the same. Trim the beef and cut into cubes, 1 to 1-1/2 inch in size. 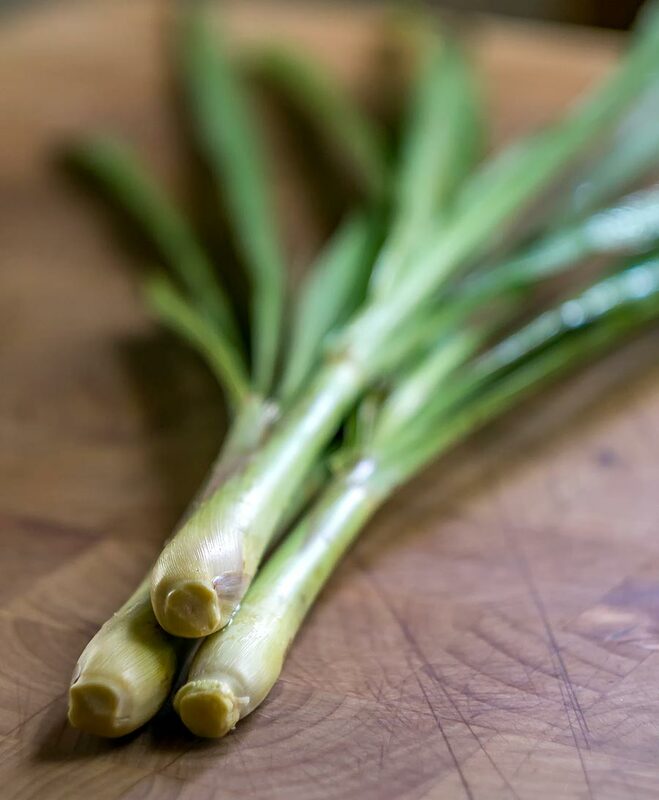 Remove the loose outer leaves from the lemongrass and cut away the top. Rinse well and cut the thick portion of the stem (bottom 6 – 8 inches) into 2 or 3 pieces. Bash them with the back of a knife, tenderizing mallet or cleaver to release their flavor and aroma. Toss together the beef chunks, lemongrass, fish sauce, garlic, ginger, Five-spice powder, brown sugar and bay leaf and set aside to marinate. Peel the carrots and cut them into chunks about an inch or so in length. Heat the oil in a large heavy pot over high until very hot. Add about 1/3 of the beef cubes, spacing them evenly across the bottom of the pot. Turn or stir to sear evenly on all sides, about 2 – 3 minutes. Remove the seared pieces to a plate and add half of the remaining pieces to the pot to sear; continue until all of the meat has been cooked. Set aside the marinade ingredients, including the lemongrass pieces (we’ll be utilizing them shortly). Drain off any excess oil, leaving the tasty brown bits behind in the bottom of the pot. Lower the heat and add the onions. Cook, stirring frequently, until soft and translucent about 5 minutes. Add the tomatoes and their juice. Cover the pot and cook, stirring occasionally, until the mixture has thickened, about 15 minutes. Stir in the seared beef or bison, the left over marinade ingredients, the star anise and a generous pinch of salt. Add the water, return to a boil, then cover and reduce the heat to very low. Allow to simmer for about an hour or until the beef begins to become quite tender. Remove the cover and add the carrots. Raise the heat slightly to bring the pot back to a low simmer. Cook until the carrots are tender, but not soft, 20 – 30 minutes. Before serving, taste, adding a little salt or additional fish sauce as desired. Fish out the lemongrass, bay leaf and star anise and discard. Ladle into serving bowls and serve hot. Garnish with a generous sprinkling of chopped cilantro and sliced limes. Serve with rice noodles, steamed rice or crisp baguette.